« Last Week to Order Hog Share! Oh my goodness the last few weeks have been BUSY! You may have been able to tell that based on the lack of blog posts. So much has happened: pigs taken to the processor, springtime work completed, but today I’m going to focus on the new life that’s joined the farm this week. On Sunday evening Rizzo the American Guinea Hog gave birth to 6 sturdy piglets. 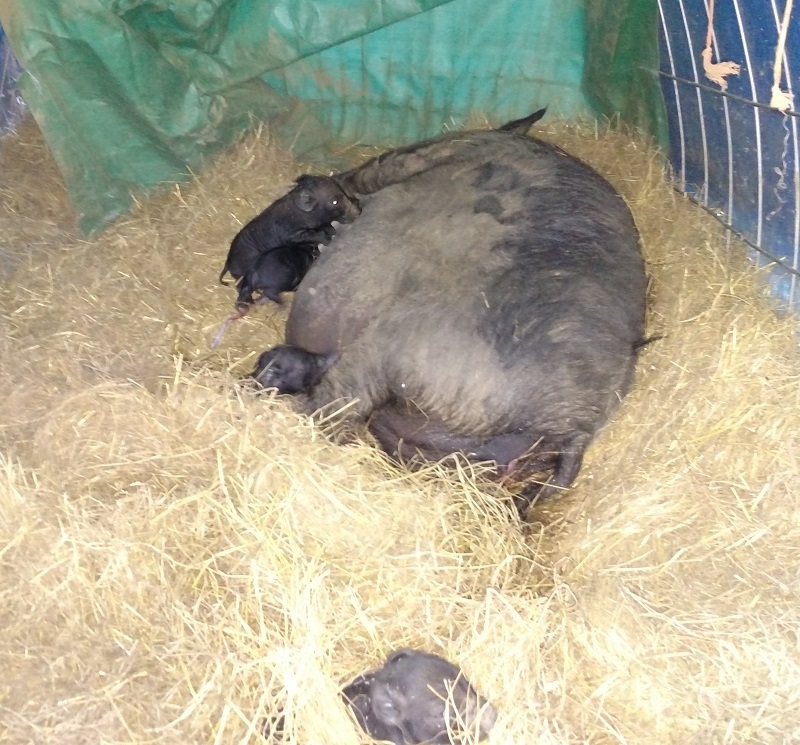 Sow and piglets are doing great. The piglets are nursing well, and Rizzo is an attentive mother. After a couple of days the piglets are exploring the world outside their house. Soon I expect them to be running around the pen! On Monday Sunflower kidded one buckling. This was Sunflower’s first kidding, and she did great. As soon as the kid was born, she was there cleaning him up and taking care of him. The buckling is healthy and very friendly! After initially letting him drink colostrum from Sunflower, we’ve been bottle feeding him. He loves people, and has fun playing with Rebecca! This buckling is available for purchase. He can be left intact, or wethered to be a pet. Price is $75. Contact us for details.